On 4/11/2011, a 2nd generation with 99% mint tag Valentino sold for $888 plus $14.95 shipping on EBay. On 1/8/2011, this MWCT Beanie sold for $175 with free shipping on EBay. 100% Authentic Ty Beanie Baby 3rd / 2nd Gen VALENTINO Rare & Pristine MWMT MQ! 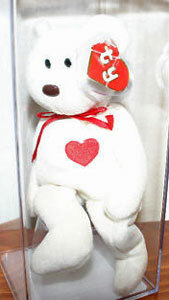 RARE Ty Beanie Baby Valentino The Bear 2nd / 1st Generation MWMT-MQ!